In our day grand generalizations have been reached. The theory of the origin of species is but one of them. Another, of still wider grasp and more radical significance, is the doctrine of the Conservation of Energy, the ultimate philosophical issues of which are as yet but dimly seem-that doctrine which “binds nature fast in fate” to an extent not hitherto recognized, exacting from every antecedent its equivalent consequent, and bringing vital as well as physical phenomena under the dominion of that law of causal connexion which, so far as the human understanding has yet pierced, asserts itself everywhere in nature. 'Address Delivered Before The British Association Assembled at Belfast', (19 Aug 1874). Fragments of Science for Unscientific People: A Series of Detached Essays, Lectures, and Reviews (1892), Vol. 2, 1801. 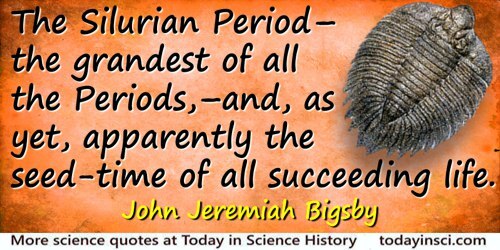 The Silurian Period—the grandest of all the Periods,—and, as yet, apparently the seed-time of all succeeding life. Dedication page in Thesaurus Siluricus: The Flora and Fauna of the Silurian Period (1868), iv.